In some way or another most of us are “stuck”-in a secret sin we can’t control or maybe by an inability to stand up for ourselves. 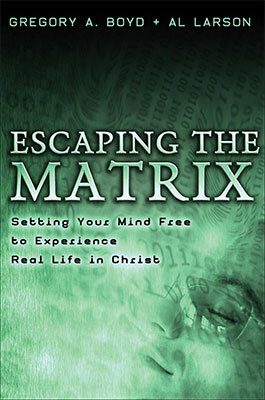 In Escaping the Matrix, authors Gregory A. Boyd and Al Larson use the vehicle of The Matrix film trilogy to argue that our struggles with habitual sin, thought patterns, damaged emotions, and phobias happen because we do not know how to take charge of the way we experience reality. The authors draw on biblical and psychological insights to provide practical resources for helping believers escape the matrix of the world system that ensnares them. While this book is aimed at the newest generation of Christian readers, all ages will be inspired by the book’s innovative strategies for experiencing a deeper life in Christ. If you’re trying to break free from something, and you’ve been struggling with the same thing for a long time, this book could change your life. Greg and Al go into some Biblical wisdom, as well as some scientific information, to truly set your mind free.